Martin Wright - 2 marathons in 1 month! The HoM awards went to Geoff Howard and Jeff Paget. Congratulations to them. They will receive technical running shirts from HoM sponsor UP & RUNNING. From Dave Wilby ... this years OMM provided not only the longest drive for many a year, but also the longest courses in the 6 years that I've been doing the event. Dartmoor was the venue, starting and finishing at Okehampton Camp in the north of the area, and as the terrain offers little in the way of significant elevation change, the organisers decided to really put the boot in by offering up approximately 100km of tussock-ridden running for those taking on the Elite course. The Harriers were well represented in this category and were led home by Derek Fuller who together with his partner put in a superb performance to claim 14th place overall. With my usual partner succombing to age & infirmity, I lined up with his younger brother who'd made the trip from Grenoble, but after a very successful first day we were brow beaten by the incessant day 2 weather, and a couple of river immersions, and slipped to 23rd. Heather Dawe & Andrea Priestley paired up for the 2nd year in a row and claimed the ladies title, just ahead of ex-Harrier Holly Williamson. Other Harriers spotted either at the event, or during a very quick flip through the results were Graham Weston & Steve Barclay, Joyce Marshall & Peter Haines, & Andy Brook-Dobson. From Martin Wright ... what can I say? What a fantastic, if somewhat brutal, experience. A large field of runners assembled on a cloudless morning in Marathon to run the original route to Athens taken by Pheidippides 2500 years ago. The race is basically a hill; seven miles flat, followed by thirteen miles of relentless uphill and then a six miles down to the finish. With that in mind my strategy was to survive to the top of the hill and then rely on gravity to see me through to the end. I survived to the top but, by then, the hill and the heat had beaten me and I knew my target of four hours was gone. It didn�t seem to matter though as the occasion and the enthusiasm of the crowds made it truly memorable. And it's not often I can say I was first Harrier home! Amanda Newham was 159th in 90:57 in this usually popular 8m/1150' fell race staged by KCAC, unusual in that it's a point to point race. 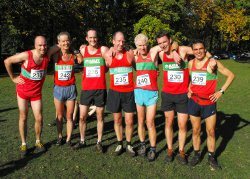 Malcolm Pickering reports ... An encouraging start to the season: a total of 21 men asked to be entered for the Complete Runner XC league, 13 ran in the first one and eight in last Saturday's race at Huddersfield. The team finishing 8th and 9th to date, so I am hoping we can make the final team placings. Tom Adams still shows the theory "you are only, as good as your last race" in that he is still very much at the sharp end, with 5th and 7th positions so far, in this high level of competition. Jim Towers, Mark Iley, Eric Morley and Nick Pearce are the only other men who have managed to run both fixtures to date. Sadly, the first Peco XC league league is on Sunday, 7th Nov, the day as our 5 miler Ben's Wish to Walk road race. However I do feel the club is large enough to support both of these events. Diane Haggar adds on an unseasonably warm day - still no sign of any mud - 8 ladies and 8 gents gallantly braved the "ever decreasing circles" of the convoluted Wakefield course. Rachel Wolfenden had a superb debut in the ladies team leading Ilkley home in 26th, followed in 29th by Emma Barclay who is rapidly regaining her form. The team was completed by Sally Malir and myself, with Kelly Harrison close behind. We took 7th team. At the sharp end there was a titanic battle between a full strength Bingley team and Holmfirth, with the latter taking the honours. The men's race was an amazing spectacle with Tom Adams (7th place) running amid no less than 7 Leeds City guys, and Leeds packing around 10 men into the top 14. Sadly I did not have a camera to hand! Well done to Jim, Mark, Nick and the other Ilkley men for sticking in there for an incredible 5 disorientating laps. There are two more Complete Runner fixtures left and we hope that those who have entered, and yet so far not raced, will be able to get there on 20th Nov at Bramley. 4m/1555' fell race near Kettlewell, very foggy on top we hear. Rob Cunningham was 8th in 19.05 in the South Manchester event. Geoff Howard reports ... I finished 47th in the Selby 10 mile race on Sunday in 66:29 (1st v60); 258 finishers. This unsurprisingly beats my Club V65 record because on that occasion I had to walk the last mile. A very flat figure of eight course with conditions rather blowy but brightly sunny and cold. From Henry Heavisides ... A fantastic event...brilliant organisation from Pete & all his helpers, great catering by Christine & the team, enthusiastic marshalling & some really good performances from all of our 16 teams. We had a lot of 2nd place teams: F35, F45, M35, M50 & M60. We would have had a 3rd place M50 team, but the rules only allow for one prize per club in each age category. Special mention to Matt Cox who set the fastest time of the day. Well done to all runners, organisers, caterers, marshalls & supporters. Nicky Jaquiery reports ... This was the first race in a series of three. A great event in a completely new area for me with varied running and plenty of hills! I was the 2nd woman to finish in just over 5.30hrs Results. Looking forward to the second race in the series in the Brecon Beacons at the beginning of December; 40 miles in winter conditions should be a challenge! Brit Tate was 32nd in 20:21 in the Leeds Hyde Park event. 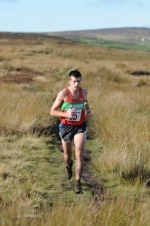 Meanwhile, Rob Cunningham was 8th in 19.15 in the South Manchester event. The FRA relays are always a good event. Teams actually do venture across borders with the aim of getting in amongst the top 3 coveted positions. This year the venue was Falkland with runners using all of the Lomonds of Fife to the full. The small but perfectly formed pair of hills, were ideal for the superb courses laid on. Each year there is a slightly different format and this year the pre-race consternation was no different. Will the long be too long? Where will the navigation leg go? And who is running on which team? On Sunday 17th October we all went up to the start line to watch the terrifying sight of Andrea Priestly and Tracy Greenaway champing at the bit and all lathered waiting for the start gun. Fortunately they were on our side. The lone piper was nearly trampled by the long distance leg heading up the hill and the rest of us went back for a cuppa. After all the winner was going to take 80minutes (predicted). In 81 minutes the leading men�s team arrived at the change over and the first of the short legs took off. Andrea and Tracey came in second to Carnthy�s Angela Mudge and Gill Mykura and Alison Weston kept this position to hand over to Heather Dawe and I. The navigation leg proved to have some good route choice and whilst we were as crafty as we could be, still managed to loose a place to Hunters Bog Trotters Women�s team who went on to win overall. Alison Eagle had the anchor leg, and was in the unenviable position of trying to hold off some of the fastest women on the hill running scene. Third place was decided in the final 100m of the event with Keswick Ladies out sprinting Kendal for Bronze. Dull the event was not! My thanks go to Andrea, Mark and Megan for putting us all up at her house and feeding us. Emma for sorting out the team despite not getting out to play herself, and of course Fife A.C. for putting on such a great day out. From Henry Heavisides ... Perfect conditions for running ...ideal temperature, sunny, no wind & no hills! The Leigh Sports Village is an unbelievably impressive facility built in 2008, in addition to the rugby stadium, sports centre, pool & hotel, Leigh Harriers have an outdoor 8 lane track, indoor warm up track & huge clubouse including changing rooms, conference facilities, refreshments & display cabinets. About 30 people ran in the race & I managed to get the gold medal for 1st M55 (I think I was 6th overall). My time of 38:44 is quite a bit slower than I've done for 10k on the road this year, but no excuses other than lack of race fitness. Not many vets run 10000m track races, so even my modest time gives me a 4th place UK ranking this year for M55. I would encourage other club members to give this event a go next year. Sally Malir reports ... there were lots of Harriers out on this fantastic day for a VERY hilly course. At around the 11 mile mark there was a King/Queen of the mountains competiion which encouraged you to sprint up a 1:5 hill when you had truthfully had enough of hills, I am not sure how many people took on this challenge. Sorry I don't know any body else's results but I was 4th lady (2nd vet 45 ) in 1.33. Paul Stephens adds ... a superb race, well marshalled, all roads closed, a beautiful morning albeit cold to start with and just a few hills! Alison Stretton reports ... there were over 900 finishers on a perfect running day. It started off very chilly with early morning frost but the sun came out for the start and, after a small loop inside Leaplish Water Park, the route took us round a full circuit of Kielder Reservoir. It had a real 'wow' factor with its beautiful scenery. It was not flat: interestingly undulating would be a polite description. Think of several circuits of Bolton Abbey and you're on the right track. It was a great choice for my first marathon. Making sure I ate every three miles and drank every mile, combined with 'Steep inclines' to concentrate the mind at regular intervals, art installations and stunning views over the reservoir meant I was well diverted. Finishing time 4:31:27. I didn't see any other Harriers but recommend it for next year. Amanda Parnaby reports ... Sharon Meadows and I travelled down to Wath on Dearne early on Saturday morning for the annual Rowbotham's Round Rotherham. This is an undulating route of 50 miles through the South Yorkshire Forest (which is mainly rural land rather than woodland). The weather was OK except for 3 nasty showers which made the ploughed fields even trickier to negotiate. Up to a couple of years ago the event was held in December and the move to mid October has meant more daylight time and better weather. Sharon Meadows adds ... The winning time was an amazing 6.29. The HoM awards went to Sharon Williams and Dave Cummings. Congratulations to them. They will receive technical running shirts from HoM sponsor UP & RUNNING. Additionally, an Outstanding Achievement Award was made to Tracey Greenway. Nigel Tapper reports ... 17 Harriers made the trip to compete in the Italian Half and Marathon and topped off what was a brilliant long weekend by scooping no less than 5 category medals! Congratulations also go to Martin Wright for completing his first Marathon. This is a linear route starting in Maranello with the half finishing in Modena and the full in Carpi. Fast and flat apart from the city centre sections that meander through the cobbled streets of Modena and Carpi (very historic though). More tour detail and photos to follow on the Forum. Chris Matthews beat her 2008 Club Record of 98:55! 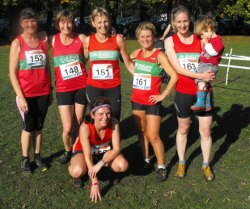 Diane Haggar reports ... A gorgeous day for the first Complete Runner XC league race at Guiseley. "Mud & Glory", well there was very little Mud but Tom Adams ran Gloriously to take 5th place against incredibly stong opposition from Leeds City & Bingley. There was a fantastic club spirit in and around the team tent, plus tremendous support out on the course. It was great to hear non running members cheering us on, particularly Pete and Neil. Malcolm adds ... what a great turnout for the first cross country race of the season.S ome 13 senior men toed the line on a sunny afternoon at Nunroyd Park. In-form Tom Adams mixed it at the front to finish 5th overall. In the team result Ilkley finished 8th out 17 clubs with 308 points. This is the best result the men's team have had for many years. WELL DONE TO ALL !! There were 23 Ilkley Harriers in the junior races. Jeff Paget reports ... I took part in the Leicester Marathon on a warm and sunny 10th October. Perfect conditions for the hour spent post race laying on the grass until my legs stopped cramping. An adrenalin rush at the outset saw me through the first mile in 5:54, but I then managed to rein in my enthusiasm and settled into knocking off the miles at about 6:40 pace. I felt great up to about 19 miles, and then started to struggle with the pace and all the remaining miles were a relatively slow grind. I was, however, determined to get below the magic 3 hour mark, and finished in 2:59:23, comfortably a PB. I came in 22nd out of 578 finishers and was the 1st V55 (and also beat the 1st V50). You can get faster as you get older! This beats Jeff's own V50 and V55 club record of 3h08:10 set at the Luton Marathon in December 2009. 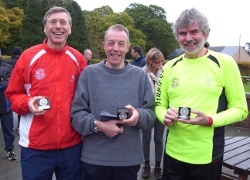 Clare Smith reports ... Tony Melechi and I represented Ilkley at this friendly low-key fell race organised by Keighley and Craven A.C. The course had apparently been altered since last year, and I was assured it would be well flagged. This didn't stop me (and others) from taking the odd poor line, especially through the tussocks after the summit. I was lucky, and very pleased, to receive a bottle of wine for finishing 2nd lady though Tony was back long before I crossed the line! Awaiting official results. Well Done to Henry Heavisides who has been selected as 1st reserve for the England team for the International Masters Cross Country race in Dublin on 13 November. From Henry Heavisides ... here are the results of the 5k time trial. Well done to everyone who took part. Thanks to Neil for timekeeping & to all of the helpers at the finish. Mike Picken reports ... I took the long trip to Inverness for my first ever marathon with nearly 2,500 others. This is a very scenic but demanding course, which starts with a quick downhill section for the first 5 miles then undulates for the rest of course, luckily there were some great sights along the Loch to take my mind off the pain of doing this distance for the first time. There were plentiful drinks stations and support at the towns / villages along the route, fortunately I had the support of my friend Stuart Forrest who could not take part due to a chest infection, his cheers from his bike at several points along the route spured me on especially at the 1.5 mile hill at the 18.5 mile mark and 3/4 mile hill at 22 miles which both felt like mountains to me. I was just pleased to finish and even more pleased to do it to raise money for www.benswishtowalk.co.uk although a lot of my sponsorship came in after I had announced I had completed it and posted pictures to prove it, as I am sure my friends and colleagues were not convinced I could ever cover that distance, fortunately I did and am getting close to raising �500 for this great cause! Emma, Ladies Team Fell Captain, says ... A fantastic run by all the Ilkley Ladies in the Ian Hodgson Relay resulted in a very convincing 1st place, in very wet conditions. Basically Ilkley Ladies led the race from start to finish, each pair handing over in first place. Helene and Heather set the scene with a fastest Ladies time on the day for Leg 1 and Andrea and Tracey finished things off with the fastest Ladies time on the day for Leg 4. A great performance by the whole team and an absolute pleasure to watch. Well done Ladies. Alison Eagle, Nicky Jaquiery      1:23:22  45th  "
Sally Malir, Sally Morley           50:17  43rd  "
Andrea Priestley, Tracey Greenway 1:29:32  24th! " Richard Reeve reports ... a very sploshy 10 miles, with a few steep dips and climbs, on tracks and paths through woodland and across fields, taking in a loop around Eccup Reservoir, a leap over a couple of stiles and some stretches on tarmac (slippery in studs) including the final uphill mile. A bottle of beer to each finisher unless your number ended with a seven in which case you got two; a good malty brew from Daleside Brewery, well worth the effort. Marshalling by Valley Striders was superb, I didn't get lost once! Fiona Schneider reports ... a great circuit of 15k in the hills above the village. It is part of the Lakeland trail series www.lakelandtrails.org which offer a race for walkers and runners. Next year they are introducing a new Coniston Marathon and booking is now open. I struggled around this one post chest infection, but just squeezed ahead of the 1st LV70.